Your wedding DJ will do far more than just play songs. Here's a list of other important tasks your DJ will handle on your big day. 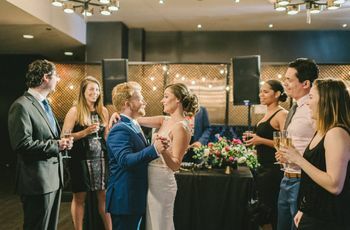 Your wedding DJ will play a vital role on your big day—and it’s actually more than just playing music to fill the dance floor. In fact, a wedding DJ has many jobs to do, some of which you’ll see, others that are more under-the-radar. That’s why hiring a well-reviewed professional is totally worth it (meaning, creating a Spotify playlist, plugging your iPhone into some speakers, and calling it a day really won’t cut it). 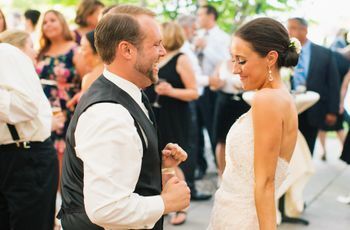 Here are the things you probably didn’t know your rockstar wedding DJ can do—aside from playing major tuneage, that is. While your wedding planner and/or venue will likely take the lead on creating your wedding-day timeline, an experienced DJ will certainly contribute, since he/she knows how long certain parts of the reception will take. What’s more, your wedding DJ is responsible for executing and enforcing the timeline during your reception, making announcements to ensure that events occur on time and if there are any hold-ups, adjusting accordingly. Having high-quality, working sound equipment is an absolute must—and your wedding DJ will have that all covered. 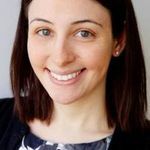 Without microphones, speakers, and the like, your guests won’t be able to hear your first introduction as a married couple, the lyrics to your first-dance song, your best man's toast, the announcement that dinner is being served, or that the last dance is being played. 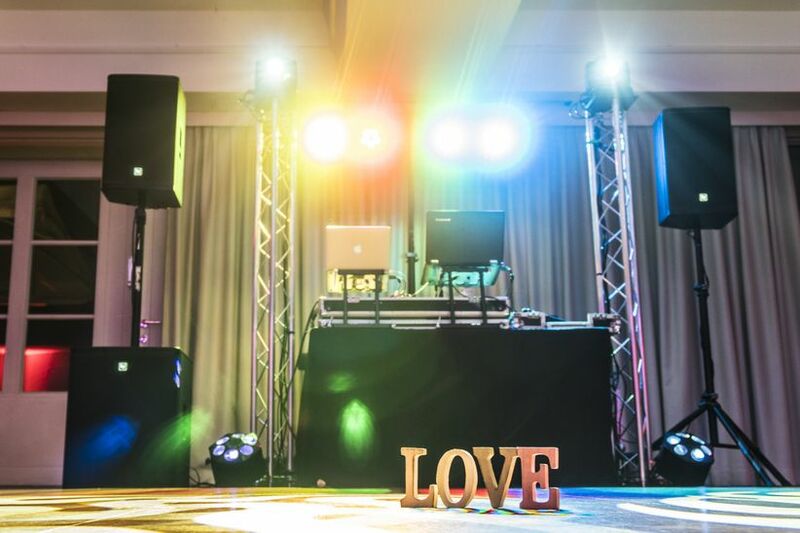 While we do recommend hiring a company that specializes in lighting for more extensive needs, many wedding DJs offer uplighting as part of their services. Uplighting consists of smaller lighting systems that can be placed on the floor and aim light upwards to highlight your tables and dance floor. Talk to your wedding DJ to see if this is something that can be included in your package, or if you’re better suited to hire a professional lighting company. 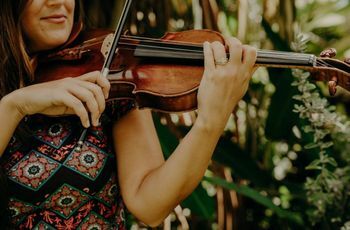 There are few things more annoying during a wedding reception than music that’s too loud, too soft, or muffled, or worst-case scenario, dead air due to malfunctioning equipment. Not only do experienced wedding DJs utilize top-of-the-line, state-of-the-art equipment, they also do sound checks at your venue well before the reception begins to ensure that everything is working properly so there won’t be any awkward silences. 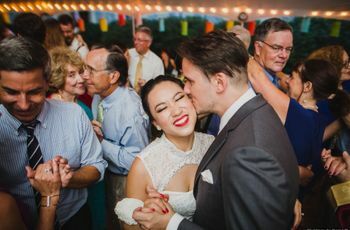 Sure, you could simplify a wedding DJ’s role by saying he/she “plays the music.” But it’s really about more than just selecting and playing songs. A wedding DJ sets the tone for your reception by playing the right songs at the right times, and reading the crowd accordingly. If you want your party to be a total rager, they’ll know the right tunes to put guests in a dancing mood. Alternatively, if your goal is a reception with an old-school romantic feel, your DJ will know how to create that vintage vibe. And, a skilled wedding DJ knows exactly how to pack the dance floor if your guests are getting a little too comfortable in their chairs. Your wedding DJ can be a great source of advice if you’re struggling to pick songs for any of your special dances. An experienced DJ has seen first-hand which songs work and which don’t, and is up-to-date on the newest tunes. That’s why it’s important to meet with your wedding DJ (in person, if possible!) a few weeks before your wedding to make your song selects and do-not-play list. Of course, your DJ will have an extensive library of songs you (or your guests!) can request, but the key is knowing if they’re appropriate and when to play ‘em. Emcee may be the most important role your wedding DJ will play. Think of your DJ as the host, cruise director, and point person for the evening, making announcements and ensuring that your guests are aware of what’s going on and what’s next. Having your wedding DJ serve as emcee is far more authoritative and professional than you trying to shout “Time for dinner!” over the blasting music. Your guests are more likely to follow directions from an experienced wedding DJ and will look to your DJ (instead of you or your new spouse) for information, so your big day will proceed smoothly and you can focus on enjoying every minute! Worried your first dance song might be a bit too long? Your wedding DJ has got you covered! Want to start your father-daughter dance with a slow song and then surprise your guests by cutting into a Michael Jackson favorite? A DJ can create a custom remix just for you. Many wedding DJs are skilled at creating mashups, remixes, and adjusting song lengths to fit your needs—just ask! Things may go wrong on your wedding day, but fortunately, wedding DJs are pros at getting things back on track. Let’s say dinner is running slightly behind schedule. Your DJ can play an extra few songs so that guests are too busy dancing to care that the food’s not ready. Or maybe your dad is in the restroom when he’s supposed to be giving his toast. Your DJ can cover until he’s available. Your guests won’t notice any potentially-awkward mishaps when you’ve got a pro wedding DJ at the helm.